When you are looking to get breast implants, you first need to decide which doctor you want to go to. Then, your consultation will answer some important questions for you. These questions might include, do you feel comfortable with the surgeon? Are they willing to answer hard questions? And do they take the time to explain the benefits and compromises of all of your breast implant choices? If you answer yes to all of these questions, you know that you are in the right place. It can be difficult to know who to go to for your breast implants. Atlanta before and after photos are a good start. If your plastic surgeon shows and explains their before and after portfolio to you, that’s a good sign that your surgeon knows what they are doing and is confident presenting and answering potential concerns. Rather than being motivated by external incentives like some surgeons are, Dr. Colgrove will listen to you and present all of your options. He won’t try to talk you into anything but will make sure you are satisfied completely with your results. Dr. Colgrove is one of the select board-certified surgeons now offering the IDEAL IMPLANT® Structured Breast Implant. This implant is a multi-layered structured implant that contains saline but has been designed to have a more natural feel and feel that saline implants. This design creates a cushioned feel, comparable to a silicone gel, but with a lower risk of implant failure by reducing wrinkling and folding, the main causes of implant rupture and deflation.The patient pictured before has 370cc IDEAL IMPLANTS, filled them to 415cc. Whether you wish to restore a youthful facial appearance, increase breast size, or create beautiful body contours, Robert A. Colgrove, Jr., M.D., understands that each patient is unique and strives to enhance their appearance with skill and a keen sense of aesthetics. Dr. Colgrove recognizes that plastic surgery is an art that requires an attention to detail to deliver outstanding surgical results. He draws upon his vast experience to provide surgical enhancements that are tailored to each patient’s individuality and unique beauty. He has an impeccable reputation, many loyal patients, and is well regarded in the healthcare industry due to his dedication. Researching breast implant Atlanta before and after photos? Contact Dr. Colgrove today to discuss your options. Simply call (770-995-9000) or visit www.colgrove.com. 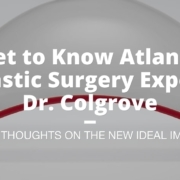 Dr. Colgrove’s office is located at 1900 The Exchange Southeast, Building 300, Suite 300 Atlanta, GA 30339. Call today for more information on IDEAL IMPLANT Structured Breast Implants.